Why do high blood sugar levels result in a greater risk for peripheral arterial disease & what can you do to reduce your risk? 17 May Why do high blood sugar levels result in a greater risk for peripheral arterial disease & what can you do to reduce your risk? Peripheral Arterial Disease (PAD) is the narrowing and hardening of the arteries that supply blood to legs and feet causing decreased blood flow. Risk factors for developing PAD are cigarette smoking, high blood sugar, obesity, high blood pressure, elevated cholesterol levels, old age and a family history of heart disease, stroke or diabetes. So, PAD can occur in patients with or without diabetes. Our focus here is to learn more about how high blood sugar levels cause PAD. Endothelial cells line the blood vessels and maintain their structure and function. In healthy individuals, endothelial cells produce nitric oxide (NO). NO causes the relaxation (widening) of the arteries and protects the blood vessels from any damage by preventing both inflammation and clotting pathways. In patients with diabetes, the constant increase in blood sugar levels cause endothelial cells to produce low levels of NO, causing arteries to constrict and encourage inflammation and clotting pathways. 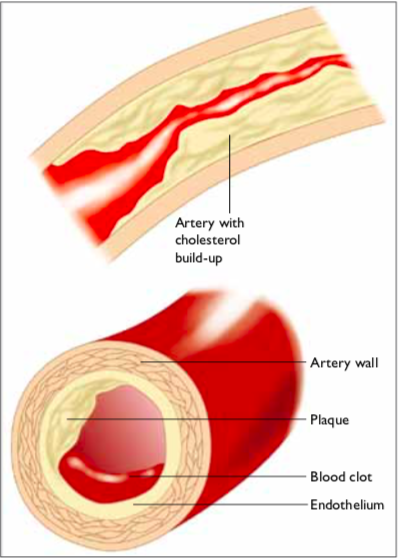 Over time, the wall of the artery gets damaged, and gradually a fatty streak called plaque builds up within the arterial walls. Ultimately, this plaque will block the artery and reduce blood flow. Fig 1. Atherosclerosis. Plaque is built within the artery, narrowing the vessel limiting blood flow (above). Along with the plaque, there is a blood clot which is created as part of coagulation pathway initiated by damage to the artery wall. Picture taken from: Burland, P., & Phillips, A. (2012). Vascular disease and foot assessment in diabetes. Practice Nursing, 23(4), 187-193. The most common symptom of PAD is pain, cramping or aching in the calves, thighs or buttocks. These are reproducible with physical activity and are relieved by rest. This is known as intermittent claudication. Nearly 50% of the patients are asymptomatic. It is believed that in diabetic patients, the impaired function of the nerves (peripheral neuropathy) hinders sending the pain signals to the brain, therefore some patients do not feel claudication symptoms. Other signs and symptoms include coldness in the legs/feet, change in colour of the legs/feet/toes, hair loss on the feet/legs and shiny skin on the legs. If you have noticed any of the above signs or symptoms, consult your podiatrist immediately. If you are visiting the podiatrist for the first time, it is always a good idea to bring a list of your regular medications. Podiatrists perform diabetes foot screenings where they ask for your medical history, assess for risk factors, check your vascular, neurological, biomechanical, dermatological and footwear assessments and tailor a management plan. In terms of vascular assessments, podiatrists will enquire about symptoms such as night cramps, intermittent claudication, rest pain and what you do to relieve the pain. They note the temperature of your legs/feet, perfusion rate, presence of hair, history of swelling, presence of any ulcers or fissures, colour changes and venous insufficiency. Most importantly, they check the pulses in your feet. Yes, that’s right, there are pulses in your feet! Don’t be alarmed if your pulse can’t be felt. Cold weather or swelling in your feet sometimes makes it difficult to feel a pulse. In such cases, Doppler ultrasound is used which detects blood flow and also gives an insight into the pattern of blood flow. If there are any ulcers or abnormal findings, your podiatrist will either refer you to hospital podiatry or a vascular surgeon for further assessment. It is crucial to maintain a healthy lifestyle by quitting smoking, having good control of your blood sugar, maintaining reasonable blood pressure and cholesterol levels, eating foods that are low in saturated fats and exercising regularly. It is never too late to make things right! Muller, M. D., Reed, A. B., Leuenberger, U. A., & Sinoway, L. I. (2013). Physiology in medicine: peripheral arterial disease. Journal of Applied Physiology, 115(9), 1219-1226. Creager, M. A., Lüscher, T. F., Cosentino, F., & Beckman, J. A. (2003). Diabetes and vascular disease: pathophysiology, clinical consequences, and medical therapy: Part I. Circulation, 108(12), 1527-1532. Ogrin, R. (2006). Review of podiatry relevant aspects of peripheral arterial disease in people with diabetes: part one-risk factors and assessment. Australasian Journal of Podiatric Medicine, 40(3), 47. American Diabetes Association. (2003). Peripheral arterial disease in people with diabetes. Diabetes care, 26(12), 3333-3341.